80 Rooms with cable TV and CCTV - Living rooms and games room with pool table - RestoBar open to the public - Confectionery - Individual heating - Safety Boxes - Air Conditioning - Medical Coverage - Lounges - Own covered garages. 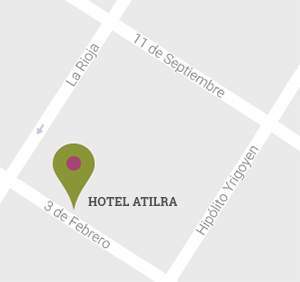 Our Hotel is one of the most modern and comfortable in the city of Mar del Plata. Endowed with the indispensable services required by today&#39;s tourism, it provides all the necessary comfort for a pleasant stay. A spacious lobby with a view to the outside and color TV service at your disposal for a relaxing time, comfortable and modern armchairs and a warm interior room specially decorated with games tables and pool. Our Resto-Bar has a wide selection of menu and wines, specialties of the chef and a renovated dining room specially equipped in a warm and comfortable environment. We provide an adequate response to the parking problem as we have covered garages located in the basement and outside the hotel. All our staff is characterized by its cordial, careful and warm attention so that our passengers always enjoy.